The artifacts are made from an opaque Chert and display a very characteristic Orange Brown Earthen Patina, known from other surface and excavated material from the Omo Kibish site. Sampling of artifacts was highly selective, because cores and debitage are not present in this series. Bifacial foliates (the largest is 7 cm long) were the most eye-catching artifacts for the collector. Holding the artifacts in my hands, I can feel the knappers intention to thin the tips of these points as much as possible. 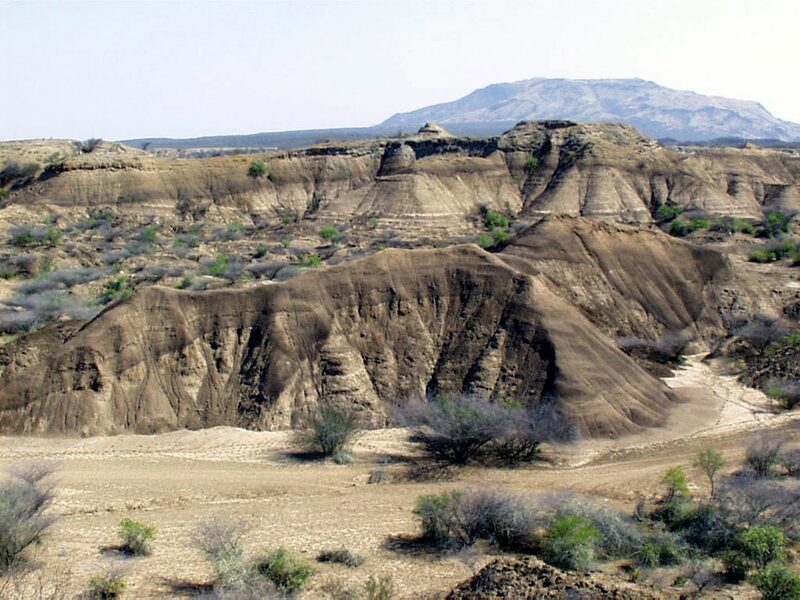 The Kibish formation of the Lower Omo River of southwestern Ethiopia, located approximately 400 km from the early MSA sites at Gademotta and Kulkuletti, has been a major location of both paleontological and archaeological finds. Both early anatomically modern human fossils and early MSA archaeological remains have been found in this region. The Omo Valley is part of the Turkana Basin, which is a hydrographic and sedimentary system encompassing about 131,000 km2 of northern Kenya and southern Ethiopia. In its present configuration, the basin is hydrologically closed and dominated by alkaline Lake Turkana, with the Omo River as its primary source of water. As recently as the middle Holocene, it had connections to adjacent rift basins and an outlet to the Nile River. Similar geomorphology was present during earlier humid phases of the Pleistocene. The Omo Kibish Formation or simply Kibish Formation is named after the archaeological site of Omo Kibish, where it was first studied. Richard Leakey's work there in 1967 found some of the oldest remains of Homo sapiens. In Omo 1, the occipital is strikingly modern (rounded), the parietals have their maximum breadth relatively high, there is only a weak supraorbital torus, and a chin is present. On the other hand,Omo 2, has a more angled occipital, the maximum breadth of the skull is lower, but the calvarium is high and arched . During the years after the original finds in 2004, a detailed stratigraphic analysis of the area surrounding the fossils was done. The fossiliferous I layer was 40Ar/39Ar dated to 172-196 k.a., and the (higher layer) Member III was dated to 105 k.a.. 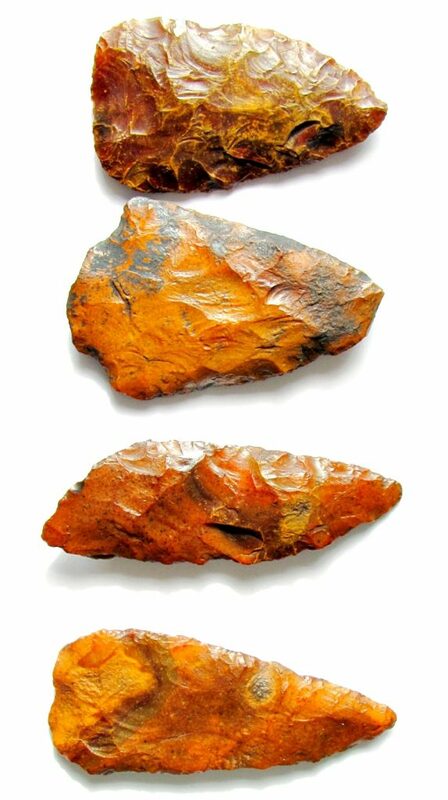 Numerous MSA lithics were found in Members I and III. Basic lithic techno-typological systems remained stable over that time. For a long time, the Omo fossils remained the oldest known Homo sapiens remains. Ethiopia / East Africa was therefore among the main proposed locations for the cradle of Homo sapiens. Fossils excavated at the Jebel Irhoud site in Morocco have since been dated to an earlier period, around 300 k.a. ago, arguing against a linear evolution of H. sapiens in East Africa and fit better to prevailing genetic data. Recently, John Shea and Matthew Sisk have presented important new data derived from the analysis of the lithic assemblages at archaeological localities in the Kibish formation. Their research has focused on three such localities with substantial accumulations of stone tools: KHS, which belongs to Member 1; AHS, which also belongs to Member 1; and BNS, located at the boundary between Members 2 and 3. Thus, the KHS and AHS sites are comparable in age with the Gademotta and Kulkuletti sites, whereas BNS dates to a somewhat later period. 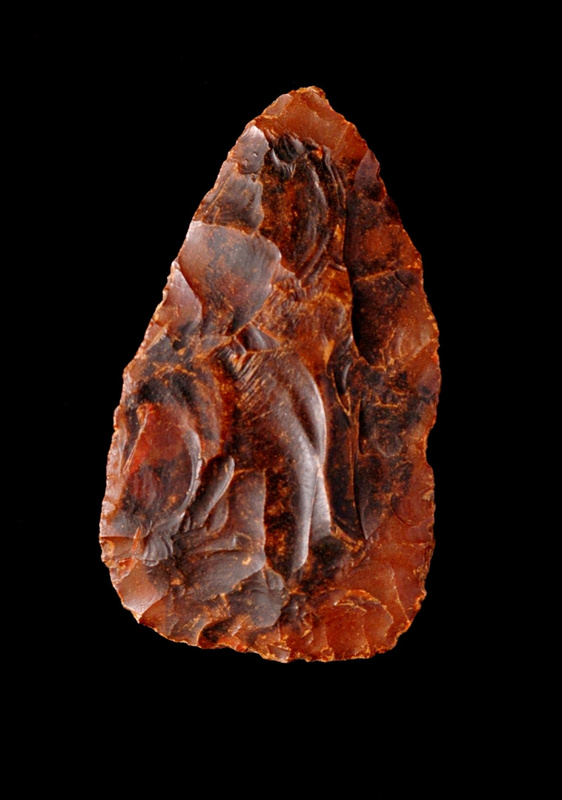 Although not directly associated with the fossils, the lithics from both excavated and surface collections at Kibish are characteristic East African MSA, with Levallois and discoid reduction strategies, and a number of bifacial pieces that vary from foliates to handaxes, the latter are uncommon. 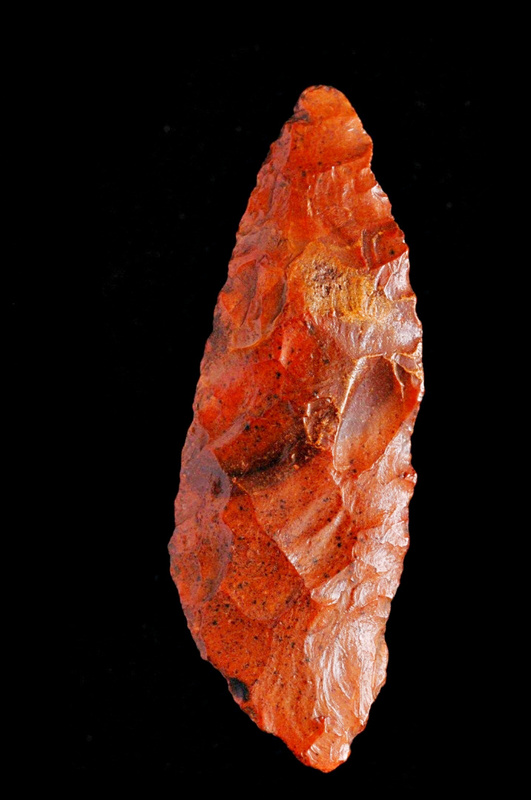 Large core-tools (hand axes, picks, core-axes, and large lanceolates) are present but relatively rare. Foliates are present in many assemblages, although their frequency varies. There is little evidence for the systematic production of geometric backed pieces, which are characteristic for MIS4/3 sites further south - including Mumba Cave in Tanzania and Enkape Ya Muto in the southern Kenya. To focus on excavated foliates, there was only one complete foliate point discovered during Shea's excavations (found at the BNS site), in addition to 16 foliate point fragments. It is likely that the number of broken points combines those that were broken during their production and those that were broken during their putatively use as projectiles as Shea and Sisk have suggested. Surface material from Kibish always exhibits significantly more bifacial tools compared to excavation areas, an observation that has still to be explained. The early occurrence of foliate points in the MSA of East Africa deserves increased attention, especially because there is much techno–typological variability, that has to be explained. Throughout the Eastern Africa MSA the Levallois technology played an eminent role in the production of stone artifacts. Discoidal and single- and multiple-platform cores are also widespread at MSA sites. Blade or bladelet production occurs at early MSA assemblages at Gademotta/Kulkuletti, at Omo Kibish and putatively Late MSA assemblages at Aduma and Porc Epic in Ethiopia and elsewhere. Porc Epic is a highlight of MSA-variability in the region. The fine lanceolate Foliates in my post from Omo are very similar to "Type 20" at Porc Epic in the techno-typological study authored by David Pleurdeau (2003). Along with the frequent use of Levallois technology, points are a defining element of the MSA. Point forms at eastern African sites are highly variable in size and shape. 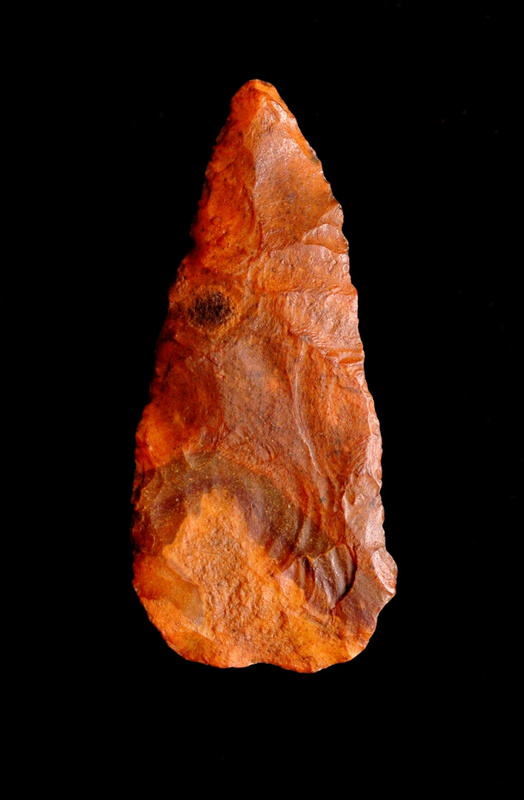 “Point” refers to a broad category of artifacts made of stone including unretouched, unifacial, and bifacial implements made on Levallois and other flake blanks. The term is both a morphological description (a pointed artifact) and an ethnographically based functional inference (as the tip of a spear or other hunting implement). Studies of point shape, microwear patterns, and mastic traces from sites in eastern Africa and adjacent areas indicate that many, but not all points were hafted and probably used to tip spears, darts, or even arrows. Others were used as butchering tools and for more domestic actions. Clark and McBrearty and Brooks have emphasized geographic variation among MSA points at the subcontinental scale, although formal definitions or tests of the extent of many of these variants remain to be done. Foliates, similar to the pieces from Omo, shown in this post, sometimes broad and short or even small and elongated are very characteristic for the early to late MSA in Eastern Africa. The Lupemban points are one of the most distinct MSA regional point variants, characterized by large (>10 cm), thin, bifacially flaked lanceolate points . Originally defined from sites in central Africa, Lupemban lanceolates are found as far east as the Lake Victoria region of Kenya. Although poorly dated in eastern Africa, the large size of Lupemban lanceolates suggests attribution to the Early MSA, consistent with U-series age estimates of 170–270 ka for Lupemban assemblages in Zambia. Figure 5: Kibish Formation (Courtesy by theNational Science Foundation).